In this study we used contrast-enhanced magnetic resonance imaging (MRI) to evaluate the vascularization of the femoral head in children with slipped capital femoral epiphysis (SCFE) before and after cannulated screw fixation. Eleven consecutive children with SCFE, seven boys and four girls, aged 10–15 years were included in the study. There were no preslips; four children had acute, three acute-on-chronic, and four chronic SCFE. The MRI examinations were performed in a 1.5 Tesla MR scanner with use of a coronal STIR sequence, a coronal contrast-enhanced T1-weighted spin-echo sequence, and a sagittal three-dimensional gradient-echo sequence. Morphology, signal intensities, and contrast-enhancement of the femoral head were assessed by two radiologists in consensus. 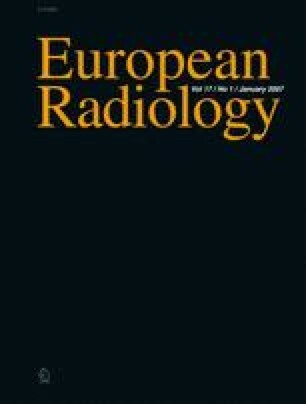 Morphologic distortion of the physis, bone marrow edema within the metaphysis and epiphysis, and joint effusion were the preoperative MRI findings of SCFE in each child. In nine children, the vascularization of the femoral head before and after surgery was normal. In one child, a preoperative avascular zone in the superolateral aspect of the epiphysis revascularized completely after surgery. One child with severe SCFE developed avascular necrosis of the femoral head after open reduction of the slip. We conclude that MRI allows for accurate evaluation of the femoral head vascularization before and after surgery in children with SCFE.